ST. PETERSBURG, Russia (AP) Two wins, eight goals and almost certainly a place in the knockout stage for first time since the Soviet era. Russia is enjoying quite the party at its own World Cup – and not even the highly anticipated return of Mohamed Salah could slow it down on Tuesday. Like a string of pre-tournament injuries that ravaged the defense. Like a run of seven winless games heading into the tournament. The Russians started the World Cup as the lowest-ranked team at the tournament at No. 70, but they aren’t playing like it. Three goals in a 15-minute span early in the second half did the damage against Egypt, with Ahmed Fathi poking the ball into his own net – the fifth own-goal of the tournament – to put Russia ahead in the 47th minute. Denis Cheryshev, with his third goal of the World Cup, and striker Artyom Dzyuba then scored in quick succession before Salah won and converted a consolation penalty in his first game back after 3 1/2 weeks out with a shoulder injury. Aside from his goal, Salah was quiet in his first ever match at a World Cup, much to the dismay of the Egypt fans in the stadium who roared every time their star player’s face flashed up on the big screen and when his name was announced before kickoff. Not to mention the 90 million Egyptians back home. Egypt’s first World Cup in 28 years could be over in barely five days, while Russia’s place in the round of 16 will be assured if Uruguay wins or draws against the Saudis on Wednesday. 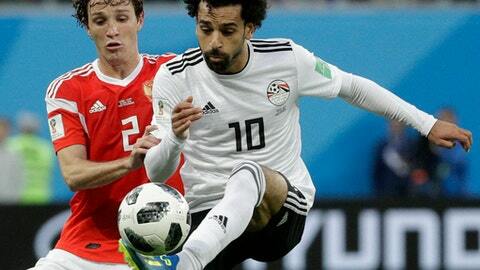 Russia neutralized Salah in the tense but low quality first half, with Yuri Zhirkov dealing well with the Premier League’s player of the year particularly when he got in front to him to clear a dangerous cross early in the first half. The Russians then took advantage of Egypt’s defensive mistakes to cruise into a three-goal lead out of nothing. Fathi’s attempted clearance for the first goal was sloppy, as was Ali Gabr’s attempt at closing down Dzyuba for the third goal. The five own-goals at this year’s tournament is only one off the record for a whole World Cup, set in 1998.